Topics: Aerials, Multipoint Installation, Plasma Tv, Communal, and Tv Aerials. 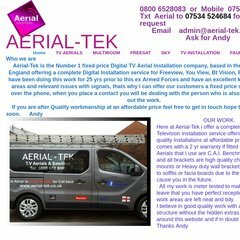 aerial-tek.net FREESAT from BBC High Definition channels Installations North west ..
aerial-tek.net FREEVIEW AERIALS,DIGITAL AERIAL INSTALLATIONS,Covering,Lancashire ..
aerial-tek.net TV AERIALS LANCASHIRE,GREATER MANCHESTER,CHESHIRE,all areas,www ..
On average 3.00 pages are viewed each, by the estimated 12 daily visitors. It has 3 DNS records, ns3.livedns.co.uk, ns2.livedns.co.uk, and ns1.livedns.co.uk. It is hosted by Fasthosts Internet Limited - Uk S Largest Web Hosting Company (England, Gloucester,) using Microsoft-IIS/6 web server. ASP.NET is its coding language environment.